The Pz.Kpfw. VI Ausf. E (or Tiger E) is a Rank III German heavy tank with a battle rating of 5.7. It was introduced in Update 1.47 - "Big Guns". The Tiger E is the late production model of the Tiger I featuring steel road wheels and Zimmerit paste on the armour. The Tiger E also introduces the more powerful APCR ammunition for the 88 mm KwK 36 gun. The Tiger E is an improved variant of the previous Tiger H1, featuring a few small enhancements to its protection, firepower and mobility. While the hull armour is largely unchanged, turret armour has been improved a bit - the large, flat commander's cupola has been replaced by a much smaller, angled variant. The turret roof armour has been increased to 40 mm (historically as a reaction to increasing numbers of Allied attack planes) and the gun mantlet is slightly more durable with a 140 mm thick armour plate on the area that used to be the weakest part. Spare tracks now cover the entire lower front glacis. Firepower-wise, the Tiger E gains the access to the new PzGr 40 APCR ammunition, with penetration of up to 200 mm at average combat ranges. Lastly, in mobility-specifications, the Tiger E is powered by a slightly more powerful engine (700 HP, H1 has 650 HP). It is easily differentiated from the Tiger H1 by its Zimmerit anti-mine coating. Commander's cupola is smaller and nicely rounded for better protection compared to Tiger H1. Almost entire frontal lower plate is covered by attached tracks, adding 30 mm of armour. 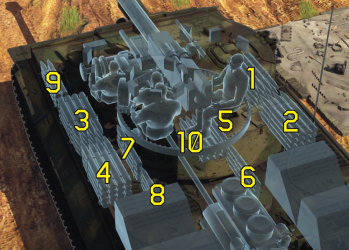 Lower side hull armour is only 62 mm thick, exploitable when flanking the Tiger, or when facing them angled. Parts of the turret side armour are covered by attached tracks, adding additional 30 mm of armour. On paper, the best angle is roughly 38.8° with armour all-round being from the front 130mm. One may feel the need to charge head-on into battle, blaring that 88 mm gun as shells bounce off the front armour while the Schachtellaufwerk suspension system runs over the ground; this is a short-lived strategy. The Tiger I should be played more as a bulky medium tank rather than a heavy tank despite its status, supporting allies from the sideline or from a distance rather than leading directly from the front. This is due to the poor armour arrangement with its "boxy" features, providing no sloping benefits alone. One must remain a distance, exploit the 88 mm long-distance power, and maintain a diamond-shape compound angling to maximize armour thickness against the trailing enemy shells that will inevitably come towards the Tiger's way. You should stick with this type of shell as it's the best. It will do incredible damage to any tank you encounter, except SPAA, AA guns, or AI artillery. You may struggle with some heavier tanks like the IS-1, IS-2, or American heavy tanks at long ranges, but well placed shots from close range or sides will do the job; all other medium and light tanks will be history as soon as this shell make a contact with them. This shell, however, will almost always over-penetrate all but the most armoured SPAA vehicles, so it is best to use HE or machine gun fire. This shell is also very useful. It has very similiar characteristics as PzGr 39, but sacrifices some penetration for about 50% more Explosive Filler, meaning even more damage than already powerful PzGr 39. It is recommended to carry some of these shells and use them regularly, as the penetration is still enough to deal with most targets (at least when being top rank), and switch to PzGr 39 when shooting targets far away, or those that are heavily armoured. On paper the HEAT rounds don't bring anything new to the table, however they can be used as a substitute for the HE shells due to the greater explosive mass and still gives you a fighting chance if you get caught with your pants down. As the APCR round for the gun, this will give you the greater edge needed to take out heavily protected tanks at the cost of post-penetration damage. The HE shell is completely ineffective against all but SPAA or the AI artillery on the Kursk and Ash River maps, and the machine gun mounted on the Tiger has proven quite capable of dealing with these. Keep a small supply of this shell on hand if you plan to flank the enemy and take out their SPAA or artillery, but avoid them for everything else. Ammo racks of the Tiger E.
The main role of the Tiger tank was to eliminate enemy tanks at a far range, similar to behaving like a sniping tank, or a Tank Destroyer. Nonetheless the Tiger can excel at brawling with other tanks at medium, even possibly against two Panther tanks to close range and escape undamaged. It's recommended to not stay in one place for too long or risk getting outflanked, spotted, or bombed. While guns like the Soviet 85 mm cannon can easily penetrate the Tiger at close range, the Tiger can stay nearly invulnerable at long range. The 88 can take out any tank on Rank 3 at any combat range, but may have problems with the IS-1's 120 mm front amour at some ranges. When having to close in a bit it is generally advisable to angle the hull to the sides by about 30°, improving the armour rating enough that it can keep away 85mm shells very well, even at closer ranges. The Tiger is still vulnerable to the SU-152s howitzer and its HE shell at any range. So whenever encountering these heavy-caliber vehicles, it should be prioritized and eliminated first. Mobility-wise the Tiger is pretty good for a heavy tank. It is much faster than a KV-1 and about as equally fast as the IS-1, although medium tanks like the T-34-85 can easily outmaneuver all three at close range. Try to use the Tiger's mobility to keep a distance rather than for closing in on a target. Don't be afraid to use the speed to fall back if necessary as the Tiger cannot survive close range engagements on open terrain vs. mediums, due to the slow turret and the vulnerability to the 85mm guns on Soviet medium tanks. The Tiger E has a better turret traverse than the H1, but the same precaution of managing a lower than average turret traverse should be taken into consideration. It is still recommended to get the Turret Drive traverse modification as fast as possible. Even then, the Tiger will have to turn the tank in the direction of the traverse to make the most of the time to quickly engage a target. This, together with very exposed ammo racks on both sides (though one side can be emptied by reducing the ammo stowage) means that facing multiple enemies at once is almost a certain end to the Tiger tank. The best option is to take cover from one tank and fire on the other. As far as ammo is concerned, the default PzGr 39 will be the standard AP rounds many players will use. The second AP round available, the Pzgr., is also a good round to use against the enemy as the shell contains more explosive filler than the default, but suffers from a lower penetration value compared to the PzGr 39. The HEAT rounds only offer more penetration at extreme ranges (>2000m) and do less damage upon penetration, so it should just be omitted from the Tiger's combat load. The best upgrade for the Tiger I E would be the PzGr 40 APCR ammunition now available to the tank, a necessary ammunition to fight the heavier vehicles in the Rank IV area, so always bring a few just in case. Upgrading the tank should mainly be dedicated to turret traverse, hull traverse (as this is needed even with the turret traverse upgrade) and engine upgrades. The Tiger's 88 has massive destructive power. 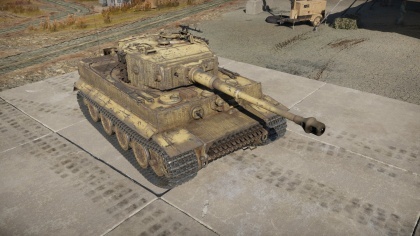 Unlike the other German tank of it's rank, all armed with 75 mm guns, the Tiger can easily one-shot all the mediums like the T-34s, M4 Shermans, and still be a threat against heavy tanks like the IS-1s. If it doesn't destroy a tank in one hit, most of the enemy crew will be wounded or incapacitated. The best place to aim with the 88 is either at the gunner's side of the enemy turret to incapacitate an enemy's firepower, or between the driver and the gunner which would usually wound or knock out most of the enemy crew at once. Attacking from the side also presents a good shot opportunity, as the best shot placement is right below the turret on the hull where most of the tank ammunition are stored, giving a big chance for an ammo-rack explosion. When driving the Tiger, plan ahead on where it will drive. Even with engine and track modifications, the Tiger is still a heavy tank and a 90 degree or more turn will almost always mean an immediate standstill as the tank try to make the change in movement. Even small adjustments can knock the speed down a bit. Thus, knowing the terrain and destination is of the utmost importance to preserve its mobility to its fullest extent. The Tiger is best used on the flanks of the current maps, as these are usually more open and allow good use of its armour and excellent gun. The centre of the map would seem more logical as there are a lot of enemies, but as has already been established a Tiger taking fire from multiple directions won't last long. Going in a flank and taking down light and medium tanks is an easy task for this beast, and thus a flank can be easily secured if the Tiger is driven carefully. Then, work the Tiger into the enemy sides and rear of the main force in the centre, doing much more damage than if the Tiger faced the force head-on because a shot to the side and rear will set most enemies alight if not outright exploding the ammunition. Quickly destroying enemies, the Tiger can quickly jump from target to target and eliminate a good number of enemies in its lifespan. During all this, make sure to always angle the hull armour to maximize longevity. With a BR of 5.7, the Tiger E faces most of the enemies the Tiger H1 could face, meaning a BR matchmaking range of 4.7-6.7. Many of the enemies in this range could effectively engage the Tiger, like the Panther medium tanks, the T-34-85, and even as high as the Tiger IIs. M26 Pershing: The American medium tank has a 90 mm cannon comparable to the 88 mm, plus with sloped 100 mm armour compared to the Tiger's vertical one. However, a clean shot on the center of the front armour when it is not angled can have the 88 mm shell penetrate straight through. The turret front is also a weak point. T26E1-1 "Super Pershing": The "Super Pershing" has a 90 mm gun comparable to the 88 mm on the Tiger II, so extra caution must be exercised when on the business end of the gun. The added armour on the Super Pershing compared to the regular Pershing also improves its frontal resistance to shells. However, there is a big weak point on the right side on the front hull, with a large hull cut in the additional armour for the machine gun. A round through here would negate the extra armour and have the 88 mm only deal with the base armour. T29: The T29 is on the same level as the Tiger II and as such outclasses the Tiger I by a large margin. If faced in the front, the only weak points present would be the commander's cupola, the gun optic on the right side of the gun mantlet, and the lower glacis armour. Facing this tank would require use of the APCR or a fancy maneuvering to its side to plant a 88 mm onto its sides. Panther D, A, G, F: At standard ranges, the weakest point on the Panther's front is the turret. Aim at the flat areas of the turret such as the bottom sides or straight into the curved gun mantlet. The Panther F presents a smaller turret target with its design, but the larger flat area still makes it a viable target for an 88 mm. Tiger II (P)/(H): A menace to the Tiger I, the Tiger II outclasses its predecessor in armour and firepower. The biggest frontal weak point, the turret front, is invulnerable to standard AP rounds from the Tiger I. Thus, an APCR is a must to have a reasonable chance of penetrating the Tiger II from the front. However, if the Tiger I can get a good shot at its side armour, a standard PzGr 39 APCBC round can take it out with ease. T-34-85: The T-34-85 with its 85 mm gun can take out a Tiger very easily if it gets a jump on its flat hull armour. However, an 88 mm shell onto the T-34-85 hull can take it out with ease. IS-2 (1944): The IS-2's 122 mm cannon can very easily deal with the Tiger I with one shot. In the original IS-2 version, the front armour is still the same on the turret and hull so the same advice from the IS-1 applies. However, the 1944 version introduces a new front hull design that makes it impervious. In the 1944 version, aim for the lower glacis armour or the turret cheeks for a penetration. Centurion Mk 1/Mk.3: With the heavily sloped frontal armour, strong turret and access to APDS, the Centurion can easily take out a Tiger I at long range. If the enemy could target an ammo rack is, they will easily take out the Tiger in one shot. FV4202: This tank is a huge threat to the Tiger. Its turret has very thick armour and the frontal armour is well sloped. Then there is the gun, the 84 mm 20-pdr gun can penetrate the Tiger I anywhere, particularly with APDS. Has access to APCR Shells. Thick frontal armour, bouncy turret. Good side and rear armour - tank can be angled effectively even against attackers from the rear. Great gun capable of defeating all other Rank 3 vehicles. One of the fastest Heavy tanks with its top speed of 45 km/h. Lower glacis is covered with tracks. Some part of it's gun mantlet is 20 mm thicker. Anti-aircraft mount with MG34 available. More engine power and faster turret rotation than it's predecessor. Ammo racks offer great targets. Slow acceleration and turning speed. Low maneuverability, susceptible to being outflanked by more quicker adversaries. Armour is weak when not angled. Has difficulties when getting uptiered. The Tiger I heavy tank was arguably the most infamous tank of World War II. The design for this tank began as early as January 1937 when Henschel & Sohn worked on a large "breakthrough" called the Durchbruchwagen that weighed about 30 tons on request by the German military. The request was modified over time for more armour and better gun that increased the weight to 36 tons, but this project was dropped in 1938 in favor of the better prototypes VK 30.01(H) and VK 36.01(H). These new prototypes were the start of the usage of the Schachtellaufwerk wheel arrangements, but these also never passed prototype stages and were both cancelled in 1942. During the development of the prototypes above, the German invasion of France showed that the Allied tanks such as the Somua, Char B1, and Matilda II were impervious to their current anti-tank weaponry and a need for better armoured and armed tanks were emphasized. So on May 26, 1941, Henschel and Porsche were asked to submit designs for a 45 ton heavy tank that was to be ready for demonstration by June 1942. During their development in June 1941, Germany initiated Operation Barbarossa against the Soviet Union and was shocked by appearance of the T-34 and KV-1 tanks that were invulnerable to all but the most potent anti-tank weapon in German inventory, one of which was the 88 mm FlaK cannon. The potency of the 88 mm cannon against the heavily armoured tanks that the Germans faced had Hitler ordered that the heavy tank design undertaken by Henschel and Porsche to utilize the 88 mm as its main armament instead of a 75 mm cannon. The designs of the tank was finalized and ready for demonstration on April 20, 1942, Hitler's birthday, and showed the VK 45.01(H) and the VK 45.01(P). The demonstration and subsequent evaluations on the two designs determined that the Henschel variant was superior to the Porsche variant, proving more reliable, more mobile, and more easily produced than the Porsche. This caused the Henschel variant to be adopted as the Panzerkampfwagen VI Tiger and production started in August 1942. The Porsche variant had many chassis produced as Ferdinand Porsche thought the design would win, so the chassis were instead used in the Ferdinand tank destroyer. What perhaps made the Tiger I so unique in tank development and German doctrine is a change of focus between the three characteristics of the tank; with more emphasis to firepower and armour than to mobility. The Tiger I contained the large 88 mm KwK 36 cannon which was very accurate and powerful, being able to penetrate every Allied armour present at its introduction. The armour on the Tiger I was also one of the greatest at the time, with an astounding 102 mm of armour on the front hull armour, 82 mm on the side superstructure and rear, and 120 mm on the gun mantlet. The armour was vertical faced so no sloping benefits were present like on the Panther. All these armour thicknesses proved invulnerable to most Allied anti-tank weaponry at the time, requiring more creative methods in shot placement to disable the tank. The mobility, while taken with less emphasis in the development, was still respectable at the time as the tank weighed about 57 metric tons, about 20 tons more than other country's main tanks, yet is able to keep up a speed of 38 km/h (Maximum speed was 45 km/h, but an engine governor was installed to preserve the engine life). The tank utilized a torsion-bar suspension system in a Schachtellaufwerk overlapping pattern, making the Tiger one of the first German tank design to use the pattern. While the design gave the Tiger I great flotation due to the use of a wider track for lower ground pressure, it had disadvantages in environment and maintenance. In the Eastern Front, mud and other foreign object could be jammed in between the overlapping wheels, which would freeze in the winter and jam the wheels; the overlapping wheels also were a hassle to change out, in order to replace one wheel in the inside of the suspension, it requires the removal of at least nine other wheels in order to access it. The first 250 Tiger tanks used a Maybach V-12 HL210 engine with 650 hp before switching over to the more powerful Maybach V-12 HL230 engine with 700 hp. The engine proved adequate in propelling the tank, but was still considered underpowered for the tank weight. The Tiger I, as innovative as it is to tank warfare, was a strain on German war production. The tank was over-engineered, taking much more man-hour and materials for its worth as a war machine. Cost-wise, two Panzer IVs or four StuG IIIs can be built for the cost of one Tiger I. The tank was also expensive to maintain and took lots of fuel to run. These attributed to the low number of only 1,354 Tiger Is produced from 1942 to August 1944. There are three main production Tiger I variants known today, the "early-production", "mid-production", and "late-production" models. The Early-production model was designated as the Panzerkampfwagen VI Ausf. H the first few batches and is distinguished by its drum-style cupola with over-swinging hatch, the model also had two vehicle lights on the front side of the tank. The Mid-production featured Zimmerit paste and a side-swinging cupola with accommodation for a machine gun mounted on the cupola, the vehicle light was also changed to just one placed right in the front of the hull armour. The mid-production was also redesignated in May 1943 as the Panzerkampfwagen VI Ausf. E. Late-production models featured the removal of the Zimmerit paste as there was an assumed flaw with it, and the overlapping wheels were instead made into interleaving with full-steel road wheels as well, in a manner similar to the Tiger II. Other specialized variants of the Tiger I were produced as well. A small number of demolition carrier models were field-made in Italy, where it had its main gun replaced by a crane to carry demolition to clear minefields or destroy obstacles. The demolition carrier version was interpreted by Allied intelligence as a BergeTiger, an armoured recovery vehicle, though it is not known if it ever saw service in this role. Another specialized variant produced in 1944 in some numbers was the Sturmtiger, an heavy assault gun with a 38 cm rocket launcher made from a depth charge. 19 of these were made and saw use in all fronts, though its most noteworthy combat action was in the Warsaw Uprising. In its introduction, Hitler ordered the new Tigers to be used in the Leningrad siege in September 1942. However, as the tanks faults were still not yet fully ironed out at this stage, the mechanical unreliability and the unsuitable terrain caused one of the Tiger Is to be stuck in the swamps and abandoned by its users. This example was then captured by the Red Army and tipped off the Allies of the development of the new Tiger tanks and so developments in countermeasures began. In North Africa, the Tigers saw first action against the Western Allies in Tunisia in December 1942. Its impact there left an impression on the Allied armour forces, but its myth as an invulnerable tank was shattered when two Tigers were taken out by the British 6-pounder anti-tank guns. The total loss in that campaign was seven Tigers by February 1943. Once mass-numbers of Tiger Is were available, they were employed in heavy tank battalions that were to be deployed in breakthrough operations or counter-attacks. Field experience with the Tiger showed that the Tiger's heavy weight proved a nuisance in operational mobility, an example being that small bridges were unable to support the Tiger tank's weight. An attempt to remedy this was to use a snorkel device so the tank could ford rivers as deep as four meters, however this system was phased out of later production models for cost-savings. The Tiger suffered reliability problems in all of its service life that impeded its effectiveness and its high fuel usage limited its combat operations. Armour recovery of the vehicle was also terrible as three heavy recovery half-tracks were required to tow the tank away, causing a strain on the German support line to keep the Tiger tanks in running order. Despite that, the Tiger I proved superior in terms of armour and armament against the Allies and created massive losses among their armoured forces, causing many soldiers to keep an eye out for the infamous "Tigers". 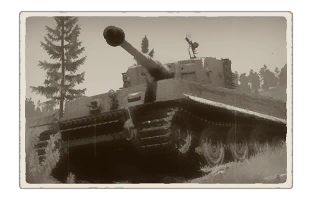 The impact the Tiger had on the battlefield as the superior tank at its introduction created fame to the commanders and crew operating this tank, further fueling the Tiger's reputation in the war as a killing machine. Some Tiger units were able to achieve kill ratios up to 10:1, and some even higher. Some notable Tiger aces known were Kurt Knispel (168 tank kills), Otto Carius (150+), Johannes Bölter (139+), and Michael Wittmann (138). However, as the war progressed and the impact of the Tiger's surprise in Kursk and Italy has dissolved, Allied developments gave forth more capable tanks able to defeat the Tiger I tanks. The Soviets solution was to upgun their T-34s with an 85 mm gun to make the T-34-85, and the Western Allies with the 76 mm and 17-pounders on the M4 Sherman and Firefly respectively.. The Tiger went as an highly-invulnerable tank design into a simple heavy tank as the war went on, and it was replaced by the more powerful and more heavily armoured Tiger II in 1944. Despite its replacement, many Tiger I models still saw use up until the end of World War II. Due to the low number of Tiger Is made during the war (1354, compared to Panzer IV's 8,550 and the M4 Sherman's ~50,000), very few intact Tiger Is are left in the world. Today, only seven tanks in various conditions exist in the world. The most famous of these is Tiger 131, captured by the British in Tunisia in April 1943. The crew abandoned the tank due to a 6-pounder shot from a Churchill tank jamming the gun mantlet and turret ring, causing it to be unable to aim. This intact tank is also famous for being the only fully operational Tiger I in the world due to a restoration effort by the Bovington Tank Museum in the 1990s. It is still there as a display and remains as the museum's most popular exhibit. 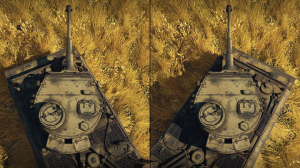 Skins and camouflages for the Tiger E from live.warthunder.com. This page was last edited on 2 March 2019, at 02:31.